RX-40-5 is R core audio output transformer for push-pull type amplifier. 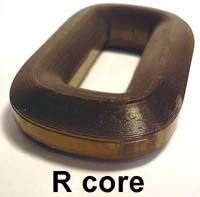 Excellent magnetic properties of R core as well as precisely wound construction of the coil by the computerized manufacturing system achieve the wide bandwidth, low distortion, and low magnetic loss of the transformer. Power handling capacity 40W, primary impedance 5,000 ohms, equipped with ultra-linear taps, the best match for push-pull tube amplifier using 6CA7/EL34, 6L6, KT66, 2A3, 300B, etc. The first graph below shows the wide bandwidth 6hz to 65Khz (-1db) and plain attenuation characteristic without any peculiar peaks and dips at the high frequency. The second graph shows the impedance characteristic as well plain and quite similar to the frequency characteristic. The flat section of the impedance on the graph reads 4,800 ohms, a little bit smaller value than the nominal specifications. The frequency characteristic of the audio output transformer varies with the magnitude of the input signal and with the signal source impedance that drives the transformer. The graph below shows the frequency response of the output transformer driven by the signal source impedance=5,000 ohms, which represents the case that the transformer is driven by beam or pentode power tubes having relatively high plate resistance. You can first notice a wide bandwidth 6hz to 65Khz (-1dB) and plain attenuation characteristic at the high frequency without any peculiar peaks and dips. The low frequency response does not attenuate even with small signal level (0.4V). This proves that the enough inductance is kept even at such low signal level thanks to the high performance magnetic core. The high frequency response attenuates in a plain manner except only a small dip between 90Khz to 100Khz. Such characteristics are ideal for stable NFB. The graph below shows the frequency response of the output transformer driven by the signal source impedance=600 ohms, which represents the case that the transformer is driven by triode power tubes having relatively low plate resistance. The bandwidth further extends compared to the above case with the signal source impedance=5,000 ohms and the low frequency down to about 10hz is almost flat at every signal level. The high frequency extends up to 85Khz (-1dB). 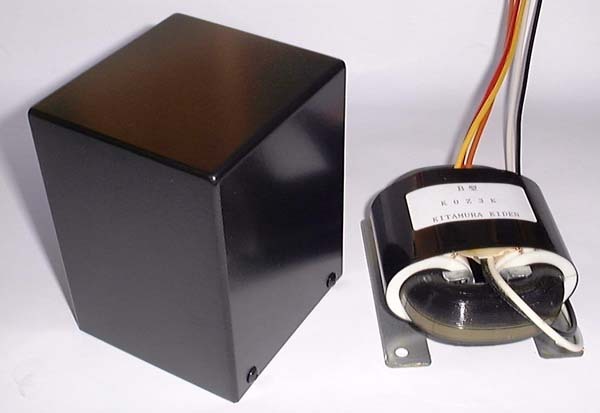 The primary inductance of RX-40-5 audio output transformer is very large, being 290H at minimum and 640H at maximum. Furthermore, the fluctuation of the inductance is quite small assuring good total performance. This inductance value is in fact equal to that of 100W class conventional type output transformers. However, the existence of the unbalanced DC current reduces drastically the primary inductance. Although the service limit of the unbalanced DC current is 5mA, we recommend reducing this unbalance down to 2.5mA or less in order to make maximum use of this R core output transformer. We have installed RX-40-5 on our test Power Amplifier and carried out the measurements. This amplifier is EL34/6CA7 push-pull type. EL34's are in pentode operation and the design maximum output is 25W. The reason to employ EL34/6CA7 push-pull amplifier for packaging test is that EL34 is a pure pentode tube having high plate resistance that consequently poses a severe testing conditions to RX40-5. If good performance is obtained with the pentode operation EL34/6CA7 push-pull amplifier, much better performance can be surely obtained with the beam tubes having lower plate resistance or triode tubes. The low frequency extends down to 10hz (-1dB) within 1W output. At 10W, the frequency response below 20hz decreases because of the core saturation. From this test result, the maximum permissible output at 20hz of this transformer is estimated approximately 10W. Since the maximum permissible output is proportional to the square of the frequency ratio, the permissible output at 40hz is 40W, which is exactly the design value. The high frequency extends up to 40Khz (-3dB), which is quite a good figure considering that the transformer is driven by the pentode operation tubes. The high frequency attenuation curve is very plain without any peculiar peaks and dips. The distortion factor is graphed as below. They represent a total distortion performance of the pentode push-pull amplifier and not only that of the output transformer itself. However, you can notice that the distortion level is very low as of a non-NFB pentode push-pull amplifier. From this fact, you can evaluate that the distortion of the transformer itself is kept at low level. The excellent magnetic properties of R core is proven by the fact that the distortion curve of 100hz is not so much degraded compared to that of 1Khz. The graph below shows the frequency response with NFB=8dB. The low end is very flat up to 1W output. The same as the above case, the frequency response below 20hz decreases because of the core saturation at 10W output. The high frequency extends up to 60Khz (-3dB). Since the high frequency curve is very plain without peculiarities, no phase compensation to stabilize NFB operation is necessary. The graph below shows the distortion factor with NFB=8dB. The distortion curves of each frequency are quite same within the output range below 10W that falls in usual service power rate. This again proves the high performance of this audio output transformer.